Located in the cool heart of the Anderson Valley, along California’s windswept Mendocino Coast, Split Rail is the most recent addition to our collection of estate vineyards. Within its varied topography of undulating slopes and benchlands, two small blocks of Pinot Gris are planted. Each one-acre block is comprised of the same rootstock but with two different clones. 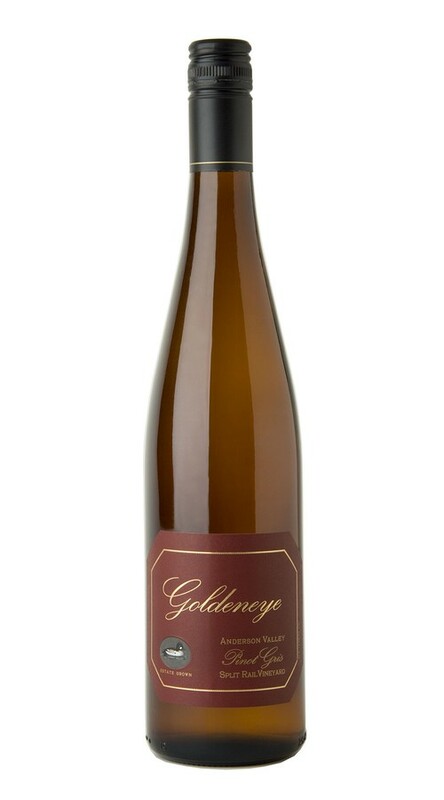 Crisp and refreshing, this wine has lovely acidity and offers a pure expression of Pinot Gris. This wine is effusively fragrant with white peach, Gravenstein apple and jasmine aromas that leap from the glass. Strikingly rich, it demands attention with its stone fruit and citrus rind mid-palate intensity. The finish lingers, offering an underlying wet stone minerality and a hint of lavender that adds complexity. With its classic varietal expression and enticing flavor profile, this Pinot Gris evokes the great wines of Alsace, via the Anderson Valley. After a cold, dry winter, we did extensive pruning to delay budbreak until the optimal time. Early spring rains and warm weather produced ideal conditions from bloom through fruit set. Though we set a larger-than-normal crop, the clusters were dense and compact with abundant small berries, which is perfect for high-quality wine. Warm summer days, cool nights and clockwork fog allowed for slow, even ripening and the retention of acidity. We harvested block-by-block over an almost languid two-month period. Like the Anderson Valley itself, the resulting wines are pure and complex, balancing a natural richness with a rustic elegance.